For some, the hardest part of working out isn't the cardio, leg presses or even indoor cycling classes -- it's walking into the gym. You might think most gyms are filled with incredible hulks and smiling supermodels, surrounded by mysterious, sinister-looking weights and machines. In short, gyms can be intimidating. But don’t let it stop you! Keep reading for some surefire suggestions from five fitness experts on how to better understand and use the gym and make it an enjoyable part of your fitness program. The open spaces can be intimidating. The cardio machines may feel too close together and, of course, the aggressive salespeople can send anyone packing. If you're new to a gym, the unfamiliar layout of the gym might make you a little nervous. "The open spaces can be intimidating," says Cindy Whitmarsh, a San Diego-based fitness and nutrition expert. "The cardio machines may feel too close together, and of course, the aggressive salespeople can send anyone packing." Jackie Warner, celebrity trainer and Beverly Hills gym owner, adds that a lack of familiarity with the equipment and "gym etiquette" can scare many people away from health clubs. But the number one tip on most experts' lists is: "Don't be afraid to ask for help." If you don't know how to use a particular piece of equipment, don't be afraid to ask the training staff, Warner says. "They should always be willing to help. And if they don't, leave that gym immediately." And while it can be nerve-wracking to interrupt someone's workout, it's OK to ask someone to "work in" (trade off doing sets on the same machine). "They should be more than willing to let you," Warner says. "And if they don't, they're breaking gym etiquette." One of the biggest misconceptions about the gym is that everyone there is already in shape. "Many of my clients have said they were not 'in shape enough' to go to the gym," said Karyn M. Gallivan, personal trainer and instructor in Human Performance and sports sciences at Tennessee State University. "When folks are out of shape, especially when they are overweight, they feel self-conscious." The truth is, no one's perfect. And everyone is at the gym for the same reason -- to improve. It's just that everyone has a slightly different starting point. Gyms have every kind of person -- young, old, skinny, heavy, male and female. "Going to the gym for the first time is like the first day of school," says Trent David, a personal trainer at Gold's Gym in Hollywood, Calif. "You may not like it, it may seem strange and lots of people hate it. But you get through it and you do fine." The marketing of most gyms and health clubs often seems to perpetuate the notion that they're for the built and the beautiful. You almost never see overweight people sweating hard to lose a pound or two in gym ads. They usually show six-pack hunks and size-zero beauty queens. But things are changing as the industry recognizes the need to address customers of all shapes, sizes and fitness levels. That's led to the emergence of clubs targeting specific groups. Curves, for example, focuses on the needs of female gym-goers. And the increase in the number of smaller, boutique gyms, as well as Pilates and yoga studios, speak to the need for all kinds of different workout spaces. 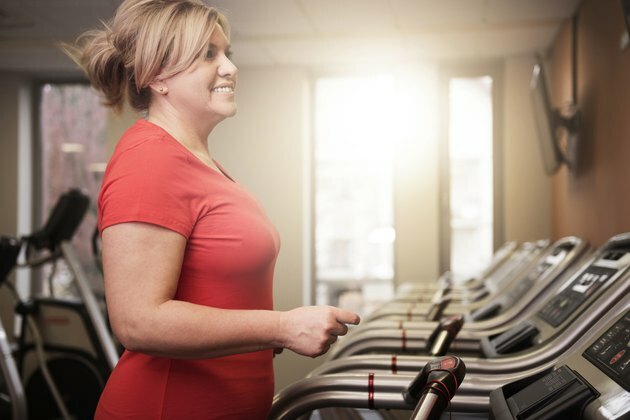 While no one is immune to new gym jitters, experts say women, particularly those over 40, are the ones most likely to fear going to the gym. That, says Gallivan, goes back to the misconception that gyms are the domain of the muscular and the perfect. Warner notes that many women also did not participate in the sorts of school team sports that required gym workouts. In general, she says, more men are at least familiar with the atmosphere and the experience of being in a gym. Those unfamiliar with the workings of a gym should consider investing in a personal trainer, even if it's only for a few sessions. But make certain you know what your goals are and be sure to mention them to your trainer. Also be sure the trainer knows you want to be able to work out on your own as well. Whitmarsh says working out with a friend or in a group also helps some people gain confidence at the gym. And it's another way to motivate you to show up for your workout. With all this in mind, you can start to move past your fears of going to the gym. And one day soon, you just might find yourself completely at home in the gym, wondering what all that anxiety was about. Is going to a gym one of your New Year's resolutions? Or is it part of a new weight-loss plan? Or maybe you just want to start some healthier habits. Are you a little nervous about walking into a gym for the first time (or returning after a hiatus)? Did any of this advice resonate with you? What else would you tell gym newbies? Share your thoughts, stories and suggestions in the comments below! Finding the right health club could mean the difference between lasting happiness or a quickie split that costs you money. Gregory Florez, national spokesman for the American Council on Exercise, says the search should begin with you. Write down what you want from a gym, what's worked for you in the past and what you're likely to stick with. "At that point, you can start to look for a gym with the particular activities [you want]," Florez says. "Check with your friends and family and your co-workers about where they work out. References are the best way to find what you're looking for." And don't forget your budget. Make sure the gym you're contemplating is affordable to you. Cindy Whitmarsh, fitness and nutrition expert in San Diego, says it's a good idea to visit the gym toward the end of the month, when health clubs may be trying to meet their monthly membership goals. You should also get an orientation from any gym you're considering. "You may have to ask for an orientation, but almost every good gym starts out each member with a complete orientation of goal setting, body-fat testing, flexibility testing and some even have nutrition information," Whitmarsh says. The International Health, Racquet and Sportsclub Association recommends that you bring a checklist of important items with you on your first visit, confirming such provisions as personal training, childcare, group exercise classes, changing facilities, parking and cardio equipment. Celebrity trainer Jackie Warner says it's also wise to choose a gym that's not too busy. This is particularly important if you intend to do any circuit training and would rather not wait for a machine. Even if you don't want to use a personal trainer or can't afford one, it's vital to find a gym that has a good training staff, says Warner. "You can pick up a lot just by watching a good trainer work with a client," she says. "That's one of the things I did when I was starting out."